Two Step Total Transportation Worldwide offers an affordable and safe Denver college event transportation services. Our team of transportation professionals makes traveling to and from your event or destination easy and comfortable. We service all local Denver schools, universities, and community colleges. From university sporting events to field trips, Two Step Total Transportation Worldwide delivers exceptional college group transportation. 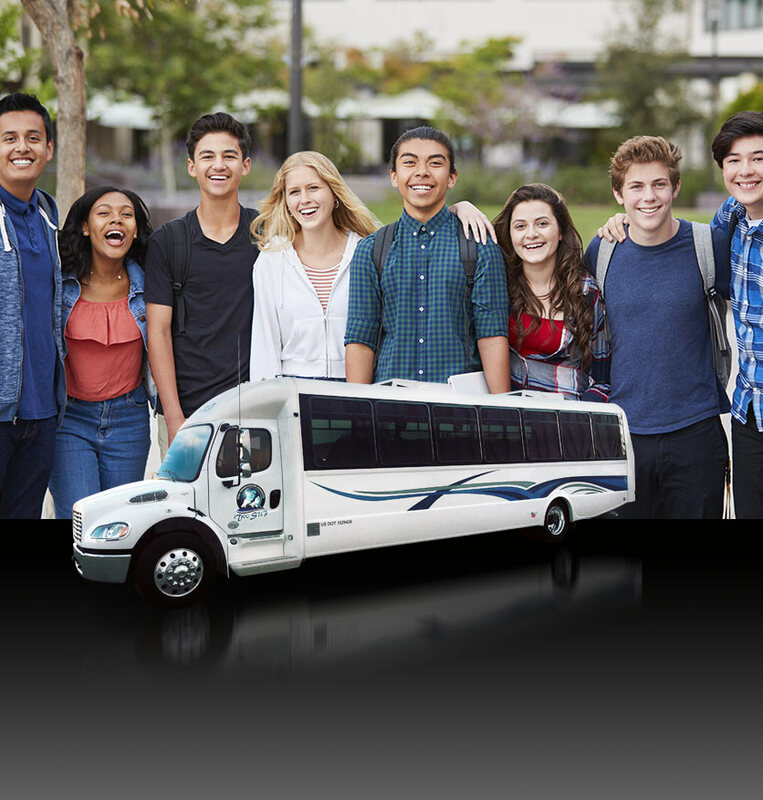 Call us today to discuss your college group travel needs, and we'll be glad to answer any questions you may have and provide you with a free college transportation service quote. Two Step Total Transportation Worldwide convention transportation team consists of professional chauffeurs, friendly receptionists and educational travel management planners who will help organize all of your ground transportation needs. 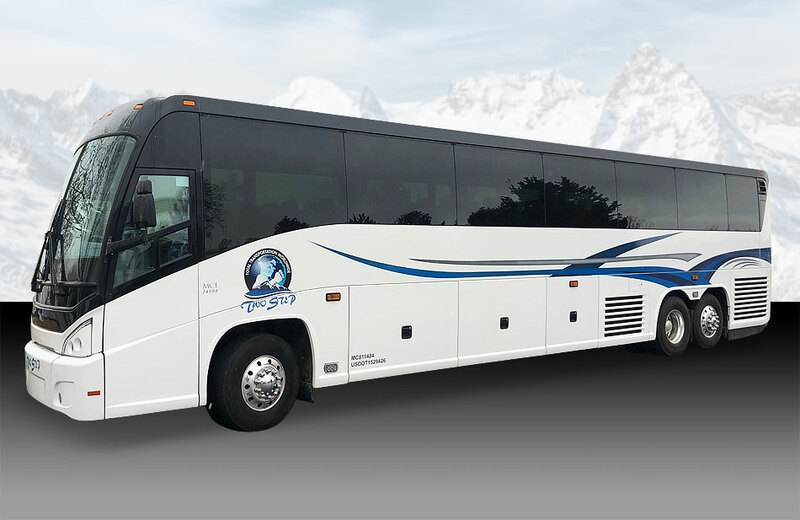 Our fleet of shuttle vehicles is made up of sedans, SUVs, passenger vans, Sprinter coaches, corporate shuttle coaches (25*, 32*, 36 & 40 passengers) and 54 passenger motor coaches. Our larger coaches offer plenty of luggage room with their spacious underbelly storage compartments. Whether it is a field trip, sporting event, debate tournament, or any other educational event, your students will arrive and be taken home safely. Two Step Total Transportation Worldwide specializes servicing student groups throughout Denver and nationwide with a modern fleet of vehicles. Here at Two Step Total Transportation Worldwide, we place a priority on student safety. Our vehicles feature the latest in travel safety measures, and our chauffeurs are professionally trained to exceed your expectations. Our Denver School Event Transportation provides vehicles that travel from point to point, fixed routes or a multiple stop transportation. Two Step Total Transportation Worldwide is fully insured and recognized by the Colorado Public Utilities Commission (PUC) LL507 and by the Department of Transportation DOT 1529426. Two Step Total Transportation Worldwide is always ready to provide you with the highest quality Denver corporate shuttle coach transportation services. Two Step Total Transportation Worldwide provides convenient customer service 24 hours a day, 7 days a week. Our state-of-the-art reservation call center is always ready to answer any questions you may have or to take a reservation. How many passengers be providing transportation for? From what location are your passengers leaving, and what is your destination? What type of trip are you planning (one-way, round-trip, airport transfer, overnight, drop-off/pick-up or other)? Which type of vehicle features is essential for you and your passengers? By visiting our Fleet Gallery, you'll be able to view the vehicles that we operate and learn about the accommodations that each one provides. If you already have a good idea of what type of vehicle you need for your school event transportation, then call us for a free service quote. Two Step Total Transportation Worldwide is always ready to provide you with the highest quality Denver school and college event shuttle coach transportation services. Two Step Total Transportation Worldwide provides convenient customer service 24 hours a day, 7 days a week. Our state-of-the-art reservation call center is always ready to answer any questions you may have or to take a reservation. * Our passenger counts change with the addition of luggage for our Mini Coaches - They change to (21, 29, 32 and 36 passengers). Enjoy the latest vehicle models for your Denver executive shuttle service. With premium seating and plenty of leg room, our shuttles make the difference. Our shuttles rate the best in safety and use the latest in transportation technology. Two Step Total Transportation Worldwide offers colleges and educational institutions the very best in Denver College Coach Transportation Services. Our new model, luxury coaches, are perfect for getting your group to your college event destination and back. Our motor coach is comfortable for up to 54 passengers. The interior is made up of comfortable individual seats that feature: overhead luggage, USB charging ports, plush seats with pillow headrests, reclining seats with armrests, 3 point seatbelts, on spot tire chains, hardwood floor, reading lights and more! 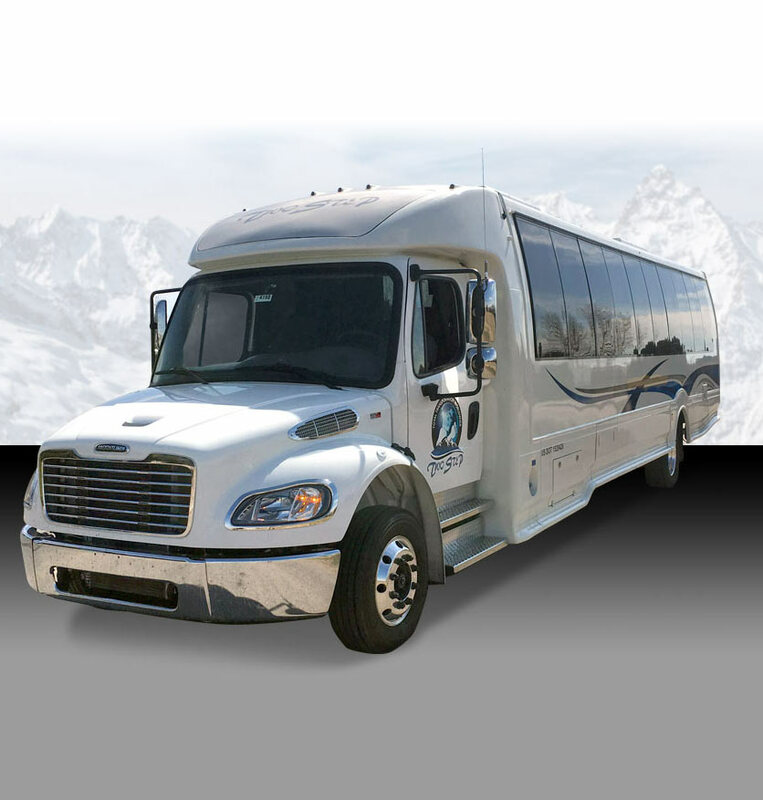 The ultimate luxury motor coach in Denver, Colorado. Our coaches offer plenty of luggage room with their spacious underbelly storage compartments. Two Step Total Transportation Worldwide convention transportation team consists of professional chauffeurs, friendly receptionists and educational travel management planners who will help organize all of your ground transportation needs. Our fleet of shuttle vehicles is made up of sedans, SUVs, passenger vans, Sprinter coaches, corporate shuttle coaches (26, 33 & 42 passengers) and motor coaches. Count on Two Step Total Transportation Worldwide for all your Denver collge and univserity sporting event group transportation and shuttle services. Our team of ground transportation professionals will make getting to and from your school sporting event safe and comfortable. Our Denver college team sporting event shuttle transportation services will get your team and students to their sporting event destination on-time and in a safe manner. Our luxury executive shuttle vehicles and coaches are a great way to travel as a group and get to your sporting event in grand style. We take the worry out of traveling, and our friendly chauffeurs are ready to make your school sporting event travel a pleasant experience. We can help you save on private sporting event transportation. Just call us today for a free service quote. We'll be glad to answer any questions you may have and provide the information you need to book your transportation.